He saw them as a great tool to be used against the Jews. The roots of the Muslim Brotherhood and, in many ways, the Nazi-Muslim axis go back to the organisation’s formation in Egypt in 1928. Marking the start of modern political “Islamic fundamentalism,” the Brotherhood from the outset envisioned a time when an Islamic state would prevail in Egypt and other Arab countries. The growth of the Muslim Brotherhood coincided with the rise of fascist movements in Europe – a parallel noted by Muhammad Sa’id al-‘Ashmawy, former chief justice of Egypt’s High Criminal Court, who decried “the perversion of Islam” and “the fascistic ideology” that infuses the world view of the Brothers. Youssef Nada, current board chairman of Al Taqwa, had joined the armed branch of the Muslim Brotherhood as a young man in Egypt during World War II. Nada and several of his cohorts in the Sunni Muslim fraternity were recruited by German military intelligence. Hassan al-Banna, the Egyptian schoolteacher who founded the Muslim Brotherhood, also collaborated with spies of the Third Reich. Advocating a pan-Islamic insurgency in British-controlled Palestine, the Brotherhood proclaimed their support for the Grand Mufti of Jerusalem, Haj Amin Al-Husseini, in the late 1930s. 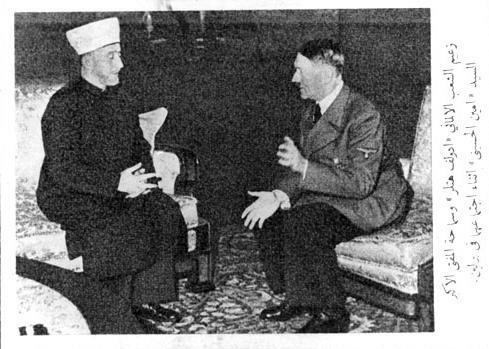 The Grand Mufti, the preeminent religious figure among Palestinian Muslims, was the most notable Arab leader to seek an alliance with Nazi Germany. Although he loathed Arabs (he once described them as “lacquered half-apes who ought to be whipped”), Hitler understood that he and the Mufti shared the same rivals – the British, the Jews and the Communists. They met in Berlin, where the Mufti lived in exile during the war. The Mufti agreed to help organise a special Muslim division of the Waffen SS. Powerful radio transmitters were put at the Mufti’s disposal so that his pro-Axis propaganda could be heard throughout the Arab world. However, the Nazis were clear in their minds that the Arabs were racially inferior, and there would, therefore, be no pleasure to be had from helping them in anything except for the extermination of Jews in their region. Dictator Chavez: “You better say I am “not” a dictator… or else. CARACAS, Venezuela (CNN) — Venezuela on Friday expelled a Spanish member of the European Parliament after he called President Hugo Chavez a dictator and criticized Chavez’s handling of a referendum on term limits that the lawmaker had been set to observe. You are currently browsing the archives for the totalitarianism category.